“Prior to the spread of Islam into Hausaland, the inhabitants toiled under a variety of pagan beliefs. Though varying in detail from one community to another, these pagan beliefs usually revolved around a high distant god (ubangiji), who was not actively connected to everyday life, and was supplemented by a chain of supernatural forces (iskoki) directly in touch with men and controlling their everyday lives. Natural resources such as agricultural land, forests, rivers, iron ore and salt deposits were believed to be in the custody of certain of these iskoki. Harmony with the iskoki was understood to be essential for a good harvest and for the success of such pursuits as hunting and fishing. Therefore, farmers, hunters and fishermen performed sacrifices and rituals, usually around stones, trees or places believed to be the habitat of the iskoki, to maintain harmony and secure their livelihood. Such conditions naturally supported a class of priests (bokaye) who acted as intermediaries between them and the people. Islam spread into Hausaland as a result of the transregional movement of scholars and traders. This is popularly thought to have occurred at some time in the fourteenth century. Available historical evidence, however, suggests that Islam reached Hausaland much earlier than this and that it was not limited to one direction or to one group. The ancestors of Usman dan Fodio, for example, moved into Hausaland in the fifteenth century under the leadership of Musa Jokollo and settled in the Hausa State of Gobir. Working day and night, collectively and individually, formally and informally, these assorted indigenous groups carried the message of Islam throughout the length and breadth of Hausaland. As it had in other parts of Bilād as-Sudan, in Hausaland too Islam transformed the socioeconomic and political structures, boosting the economy and paving the way for the emergence of numerous independent Hausa states such as Kano, Zaria, Katsina, Gobir, Kebbi, Zamfara and Daura. 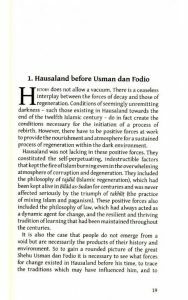 With the spread of literacy and the accompanying flow of Islamic literature, Hausaland became increasingly incorporated into the wider Islamic fraternity, with its people becoming well informed about Islamic thought and ideas and about the history, geography, politics and economy of the known world. Eventually, Islam emerged as a political force in the latter part of the fifteenth century, bringing changes in the political leadership of some major Hausa states. 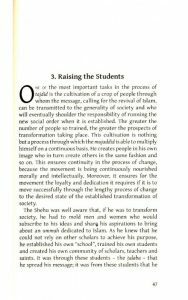 Foreword These developments were particularly notable in Zaria, Kano and Katsina, which at that time formed the core axis of Hausaland. The leadership of these states in that period is still remembered for the bold changes they effected in their administrations to make them conform to Islamic standards. In Kano, for example, Muhammad Rumfa invited Shaykh Muhammad al-Maghili, a North African Muslim jurist of international repute, to advise him on administering an Islamic government. Al-Maghili’s visit to Kano was of great significance to the process of Islamization in Hausaland, for his books and religious rulings (fatwās) gained wide circulation. One of his books, Taj ad-Dīn Fī Mā ‘Ala-l-Mulūk, described as a comprehensive treatise on government, seemed to have been highly influential throughout Hausaland. As Islam gained strength in Hausaland, its significance as a pilgrimage route and center of learning increased. By the sixteenth century, the reputations of some Hausa state capitals as centers of Islamic learning – Kano and Katsina in particular – were already high enough to attract many Muslim scholars and students. The Ḥajj, serving as a permanent link with the rest of the Muslim world and a source of continuous flow of Islamic thought and ideas, further reinforced the intellectual development of Hausaland. In due course, an educational system with a clearly defined curriculum and methodology was fashioned along the lines of Sankore University of Timbuktu, from which it seemed to have received its greatest impetus. However, the Moroccan invasion of Songhay at the end of the sixteenth century, with its attendant seizure of Timbuktu, weakened that intellectual impetus and upset the political stability of Hausaland, because the power of Songhay had kept some of the leaders of the Hausa states in check. With the rise of another axis of power in Hausaland, the seventeenth and eighteenth centuries saw the almost equally powerful Hausa states engaged in continuous and devastating interstate warfare without a clear winner emerging. Quite naturally, the security, economy and learning of Hausaland were affected by this situation. Though learning continued, even in these difficult circumstances when movement was restricted, there were many obstacles to the spread of knowledge. Entrenched in warfare and desperate for victory, rulers in Hausaland were willing to go to any lengths to win battles, even if it meant violating the limits set by Islam. Political leadership gradually degenerated into tyranny and corruption resulting in injustice, oppression and misery for most of the people. The consequent materialism and permissiveness gave the receding paganism a chance to resurface and some Muslims started once more to mix Islamic practices with traditional pagan rituals. Muslim scholars, who form the backbone of any Muslim society, were also affected by the pervading decadence. Some gave support to the tyrannical order by joining the rulers, whereas others withdrew into silence, leaving only a few courageous scholars to raise objections and to point accusing fingers at the tyranny and corruption around them. One of the few, who dared to raise his voice and who in fact organized a jihad, was Shaykh Jibril ibn ‘Umar, with whom Usman dan Fodio studied and from whom he may have acquired his fervor to revive Islam and to restore the Sunnah. It was out of this rising tide of discontent on the one hand and expectation on the other that Usman dan Fodio emerged. How Usman responded to this challenging situation is precisely what this book is about. Because this work has been produced outside of a conventional scholastic environment, it is blessedly free from those pointless academic technicalities for which universities today are so well known. The imaginative capacity, analytic insight and unique style of the author give the reader a rich and profound account of the great phenomenon that is the Sokoto jihad. By drawing on the rich intellectual inheritance of the Sokoto khilāfah, and relying on the original Arabic works of the Sokoto jihad leaders and 9 Foreword their contemporaries, the author has rescued the reader from the distortions, misconceptions and fabrications, which permeate the works of European scholars and their heirs. For almost a century, the Muslim mind has been under the sway of imperialism, especially as manifested in its educational institutions. Muslim history has been distorted and all access to the true message of Islam has been denied. The Muslim personality has been under persistent attack and the Muslim mind fed entirely on euro-centric thoughts and ideas. Muslims, therefore, have lost self-confidence and have developed an inferiority complex. This has led to meekness and docility and a tendency to readily imitate European thought. However, history, it is said, has a habit of repeating itself and Islam, with its characteristic resilience, is reviving itself from within the very fortresses of imperialism.